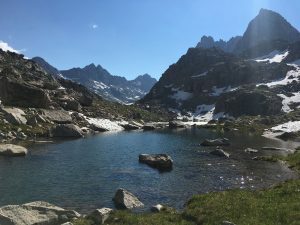 It's October and I'm just now posting a brief recap of my hike on the Wind River High Route this past August. 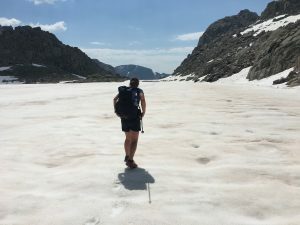 It's worth a review as this was some of the most stunning alpine trekking I've done. We (mostly) followed the Alan Dixon route. It was roughly 80 miles and took us just over 5 days to complete. The fun started the evening of July 30 when I picked up JR from DIA. 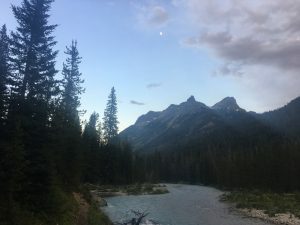 I had seen JR briefly the previous October, but we hadn't hiked together since the miles we shared in Oregon and Washington on the PCT, finishing our thru hikes together at the Canadian border. 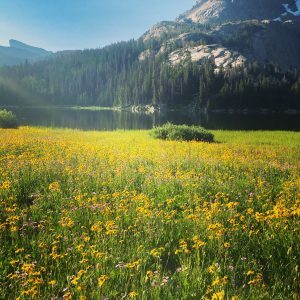 Most of July 31 was spent driving from my home in Colorado up to Pinedale, WY. We arrived at the Green River Lakes Trailhead and began hiking around 5pm. The 10ish miles we hiked that evening were a gentle climb on well-maintained trail up the stunning river valley. The horizon was filled with views of the mountains we'd be hiking through for the next week. A brief storm rolled in just after sunset, treating us to some fine alpenglow as we set up camp. The following morning, we climbed up and over beautiful Knapsack Col. Weather was perfect and the views were stunning. We stopped for a short break on the way up to dry out our gear, snack, and admire the views. 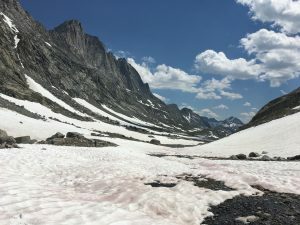 The hike down into Titcomb Basin was snowy and stunning. After passing the Titcomb Lakes, we came to a trail junction and headed up towards Indian Pass. 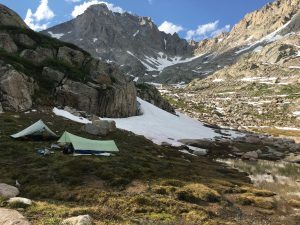 We made camp by a couple of lakes above treeline in Indian Basin. 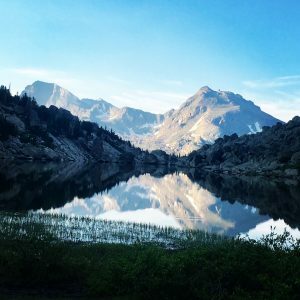 I am reminded of being in the Sierras-high mountain passes and sublime alpine lakes. Dinner by a glacial lake. Moon rising over craggy peaks. Wind rustling my tarp as I drift in and out of sleep. 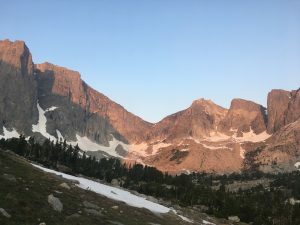 August 2nd, we are hiking up over Indian Pass by 6:30am. Dropping down the other side, we traverse Knifepoint Glacier, heading towards Alpine Pass. Arriving at the pass, we check our GPS and find that we're at the wrong pass. 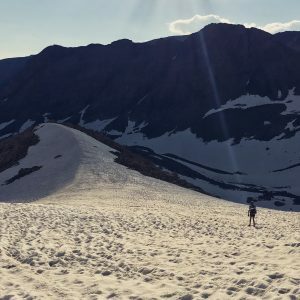 We spend the next hour retracing our steps across steep, snowy glaciers, and do some class 3 scrambing up over the loose scree of Alpine Pass. We are at the top, glad to be back on route, and the view before us eases the frustration of getting off track. Descending to the Alpine Lakes is steep and snowy. We glissade, but at this point, my legs are pretty torn up from glissading on hard snow multiple times over the past couple of days, so I run/slide/shoeski the remainder of the way down. The first lake is frozen, so we walk across the ice and avoid the scree fields on either side. Lunch was on the cliffs above the middle lake. It was too beautiful not to stop. The afternoon was more climbing, more boulder fields, more traversing snowy mountainsides above lakes. Camp is by the middle Golden Lake (Lake Louise). The mosquitoes have been hatching this week and it is intense. Massive clouds of them. All. Day. Long. But the views can't be beat and this range feels so remote. Each day holds new challenges and adventure. Aug 3rd. Hiking by 6:45am, we head up over Hay Pass. We find bits of "use" trail by a couple of lakes, but I've let go of finding trail. I just enter into whatever is before me. There is a lot of snow melt and we are walking through marshy meadows and low brush that's cutting up my shins to the point that they're bloody and raw. The mosquitoes are the worst yet. The worst I've ever experienced, actually. Stopping to check maps and GPS is miserable. We reach Halls Lake and take a quick dip. It feels amazing to wash off the dirt and sweat and bug bites. 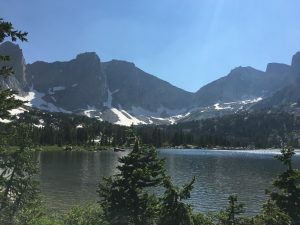 We traverse past several more alpine lakes. We end the day climbing a snowy pass that drops us down into Bonneville Basin. There is a couple heading in the opposite direction and we give them the maps we no longer need. They give us each a gin-gin candy. 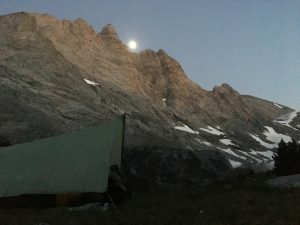 The moon is almost full and we are camped by yet another beautiful lake surround by boulder fields and snow. What a day. August 4th. I finally slept well, thank goodness. Hiking by 6:30am, we crossed boulder fields, heading toward the outlet of the lake. We scrambled down next to a big waterfall. 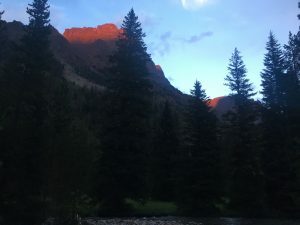 From the bottom of the basin, at first light, looking back above the waterfall at the peaks from which we just came was magical. We climb out of the basin between Mt. Bonneville and Raid Peak. A short, but steep climb. More mosquitoes. More boulder fields. 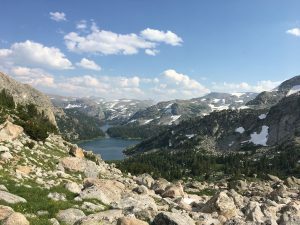 Then down onto a bench around 11,000' with a few lakes, a few bits of trail, and fairly open walking towards our next landmark-Pyramid Peak. Around this time we hit trail and were mostly on trail for the remainder of the trip. Which was sort of relieving, but also sort of sad. Route finding forces you to stay present and aware, and I liked that, even though it can be frustrating at times. 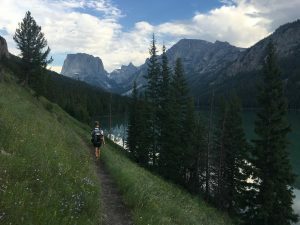 The afternoon was fast miles on well maintained trails, past Pyramid Lake, Skull Lake, and then up to Shadow Lake and over Texas Pass. Back on maintained trail, there were so many people. It was quite a change from only seeing a handful of people over the entire previous week. 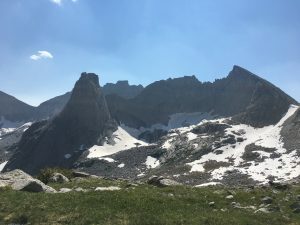 We dropped down from Texas Pass into the Cirque of Towers. Much of the trail was still obscured by snow, so we followed the general direction of the streams flowing down the mountainside. The cirque is stunning and it was a beautiful blue sky day. We took our time as we headed toward Lonesome Lake. It was still early when we set up camp, so we enjoyed a swim and I laid in the sun while JR made a campfire. Perfect day on trail and I was sad it was our last night out. 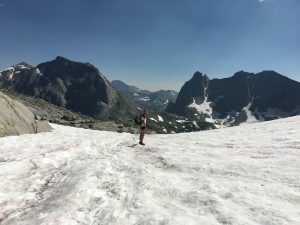 With the mosquitoes, the higher than normal snowpack, the rushing rivers, the marshy meadows, and the navigational challenges, it had been a tough couple of days, but I was not ready for the adventure to end. August 5. Hiking by 6am the final morning. We were treated to an awesome sunrise as we hiked out of the Cirque over Jackass Pass. The remaining miles were along nice gentle trail, down past Big Sandy Lake and along the river to Big Sandy Trailhead. We walked in silence as we passed group after group of hikers with big packs. The trailhead was packed and it didn't take long to catch a ride back towards the highway. A few hours and a few rides later, including a retired lawyer and a cowboy poet, we were almost back to my car. The adventure culminated with a 30 mile lift on the backs of ATVs with a couple of bear hunters. And just like that, it was over. 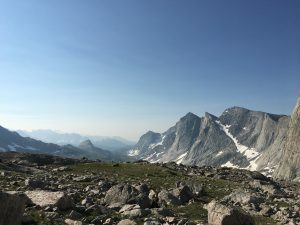 By dark, we were at the Wind River Brewing Co. in Pinedale, tired, sunburned, and back to the 'real world'.